Tropical Cyclone Idai has seen Zimbabweans burying their differences and unite as they fundraise and collect goods to help victims of the deadly storm in Manicaland and Masvingo provinces. The cyclone, which has so far claimed 104 lives, has seen all forms of assistance and solidarity messages pouring from different angles. The donations include food, clean water, warm clothing, medical supplies and blankets. Politicians, corporates, celebrities and individuals have come together to donate and wish the affected families well. This comes at a time President Mnangagwa is visiting Manicaland to assess the extent of the damage caused by the cyclone. Government has disbursed $50 million towards the disaster and Econet Wireless chipped in with $5 million. The mobile company also launched a $50 000 crowd funding campaign. Zanu-PF Secretary for Information Cde Simon Khaya Moyo has since consoled the bereaved families, while the party’s Youth League launched a campaign to mobilise donations for the affected families. The Zimbabwe National Army has been on the ground conducting search and rescue missions. One of the country’s leading undertakers, Doves Funeral Assurance, has pledged caskets to bury the deceased and burial services as and when required. Total Fitness Gym members, trainers and staffers have not stood by as the nation comes together. In a statement, Doves chairman Mr Godknows Hofisi appealed for policyholders and Zimbabweans in general to donate to the affected families. “We are appealing to our policy holders and Zimbabweans in general to donate food, blankets, clothing, water, medical supplies and other necessities to the affected families,” he said. “Donations can be made through the Doves branches countrywide. “Doves has teams on the ground in Manicaland who can be contacted on 0772207299 or 0772959432. 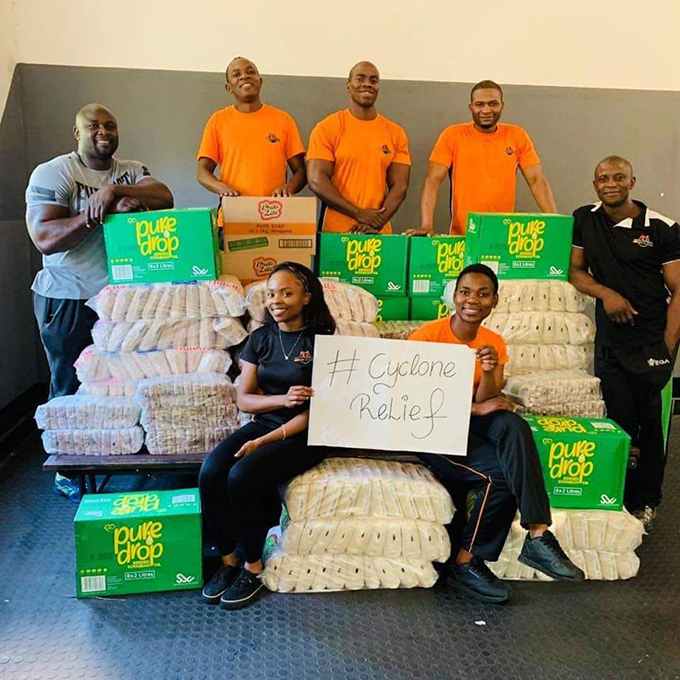 Zimpapers group public relations and corporate affairs manager Ms Beatrice Tonhodzayi said the firm donated $10 000 to the cyclone victims and all donations through the integrated media house can be dropped at all its offices in Harare, Gweru, Bulawayo, Mutare, Masvingo and Kariba. Other media houses, AMH and AB Communications, also called for donations. Miracle Missions, Islamic Cultural Institute, One Hope Initiative, Rotary and Eat Out Movement also came together and mobilised about nine 30 tonne trucks comprised of different commodities. #My Nation First, Me Second Campaign led by Chivi South Member of Parliament Cde Killer Zivhu also encouraged people to donate to the victims. “Let’s stand together as a nation and donate food, new and used clothes, water, etc,” said the organisation. Rotary Club co-ordinator Mr Tatenda Tavaziva said donated goods will be taken to the affected areas today. From the entertainment circles, a concert has been lined up for Sunday to raise funds to assist victims of the cyclone. Top artiste Jah Prayzah also launched a personal campaign where he is collecting donations to be channelled towards assisting the cyclone victims.